I’m looking for a lost Duckie! He was near and dear and is really missed. He was purchased for my girlfriend in the mid 90’s (1993-1996 maybe??) at an unknown store in the Raleigh NC area, and I don’t know what brand he is. He is very similar to the Webkinz Pink Googles, except yellow of course 🙂 and his fur is less shiny and he’s somewhere between 15-20 inches. He was stuffed with small plastic beads, if that helps at all. 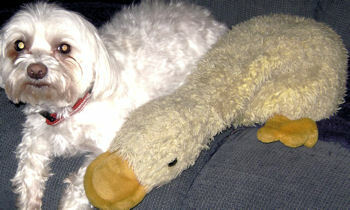 I’m desperate to find an exact same Duckie to replace him, so if anyone can help me I’d be forever indebted. 110373347064 Hope this is it. best of luck! Thanks Rosemary for getting this onto the site so quickly and also thanks to the first poster's suggestion. I've seen that model on ebay and it is close except that it has arms unlike "Duckie" which may not be obvious in the picture I sent. Your "Duckie" is one of my daughter's favorite friends, "Mr. Quackers". I purchased him at JCPenney sometime between Feb 1996 and 2000. I tried to find him in her room to get more ID information but couldn't put my hands on him right away. If you still need the info let me know and I'll get it to you once I find him. Please do let us know what you find from the tag, and I will relay the information. hi, did you ever find the right platypus? I have the exact same one and still have him but I’ve had him for so long that i’m not sure of the make as the label has worn away. but i would love to know any info anyone has! I haven’t found anything but still looking. I checked out the Mr Quackers lead posted by Liz. I couldn’t find anything from JCPenney or searching by name. If you have any information I would definitely appreciate it. It’s been quite some time but I was wondering if you guys are still searching? Please let me know if you are still looking for this little guy– I recently found some of my old childhood memories and I know how she might be feeling. His tags are different, which is how I can tell that he’s not quite the same as mine. Your gilrfriend might be able to tell which one is the proper model… I think the fuzz material might be the main differentiation, and the ebay duck is not as floppy as the JCPenney one.